Joel Andersson received his PhD in Material Science from Chalmers University of Technology in 2011. 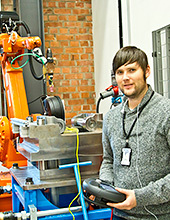 Dr. Andersson is since 2012 responsible for the RnD work related to superalloys and fabrication of hot structures at GKN Aerospace in Sweden. Dr. Andersson is apart from Chalmers also affiliated with University West in Sweden where he as well as at Chalmers supervise PhD students and work as a post-doc. researcher in the field of superalloys and weldability. There might be more projects where Joel Håkan Andersson participates, but you have to be logged in as a Chalmers employee to see them.